At the time of this writing, real-time scanning is not provided directly by ClamWin. To add that feature, there are multiple solutions, including WinPooch. 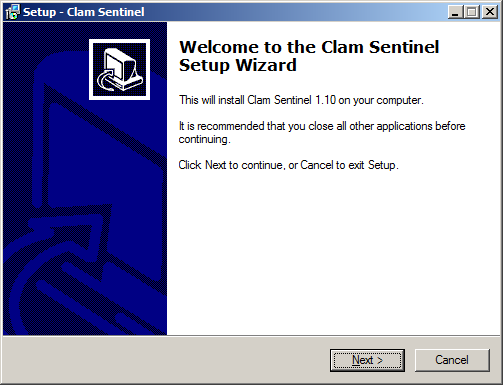 This guide will show using Clam Sentinel. The author of this text has tried recommending Clam Sentinel to multiple people, and helped to get it installed. Users who were individually helped have later noted that their system is running very slowly, and similar reports surfaced when this was recommended to groups of people. The severity of the problem was so great that even a proponent of the software felt compelled to place this warning here. Failing to provide this warning would just seem irresponsible. The severity probably varies between different systems. One system may be able to run this software pretty fine, while other software may be very heavily impacted. As this is an Open Source product, internal solutions are likely addable (by adding some thresholds that alter behavior based on available system resources). Otherwise, perhaps some solutions may be found by using some other solutions to control the system slowness. One system tested some various solutions regarding handling a busy CPU. The solutions tested are discussed further in the section about handling CPU usage. Suffice it to say that there is an Open Source solution (named Battle Encoder Shirase) which may have helped, although Process Tamer did seem to be a bit more useful. Other than CPU handling, there may be some other approaches to help with system slowness. Further discussions may be seen by checking out some resources pointed to by the section on troubleshooting slow systems; especially handling busy disks. Obtain the file from http://ClamSentinel.sf.net. Installation is straight-forward. 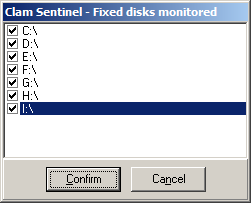 After installation, some older versions of Clam Sentinel had one item to configure in order for the software to really be useful, which is to configure what fixed drives exist, as noted by the Clam Sentinel Configuration section. This might not be needed with newer versions. 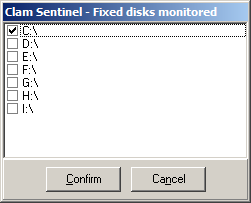 Choose “Advanced settings” and then “Choose fixed disks to monitor”. With some older versions of Clam Sentinel (this might not be true any more), only “C:\” will initially be checked. This software may be intelligent enough that it only shows the drives that “My Computer” identifies as “Hard Disk Drives”, and does not show the drives identified by “My Computer” as “Devices with Removable Storage”. So, go ahead and check all the boxes before choosing the “Confirm” button. On the other “Settings” menu, the first option, “Run Clam Sentinel on startup”, should be checked if long term protection from Clam Sentinel is desired. This option starts out unchecked, so go ahead and check it. The information that had seemed most reasonable to increase protection by the largest amount was a recommendation to enable these options. 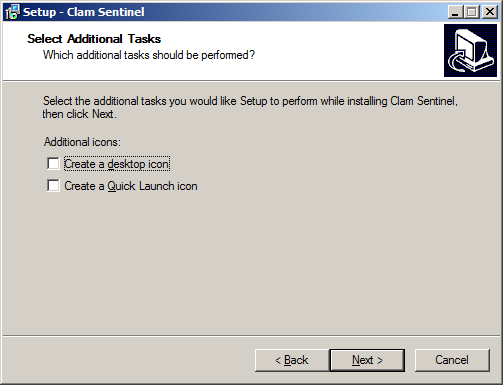 To do so, with versions of Clam Sentinel that supported the options, access the shortcut/context/“right-click” menu of the Clam Sentinel icon in the “system tray”/“message notification area”, and under “Settings” there are three options which were off by default. “Use daily signature for realtime scan”, “Use daily signature for memory scan”, and “Use daily signature for drives scan”. Another option that may be customized is the “Paths not scanned” list of folders located under “Advanced Settings”. Specifically, add in any quarantine folders of any scanning programs used. People using a trusted download source might decide to not scan content from that download source. Note that doing that would allow malicious software to enter the computer system if that software was provided by by that software source. Also, any other malicious people would be able to introduce any malicious content if they have permissions to be able to write to those locations. As an example, malicious people, who are unrelated to the organization behind the Steam software, may write to Steam's area of the hard drive if these malicious people know that Steam's area of the filesystem is not checked or enforced as rigorously. Do not just assume that Valve software is the only organization that would try to write to Steam's directory. 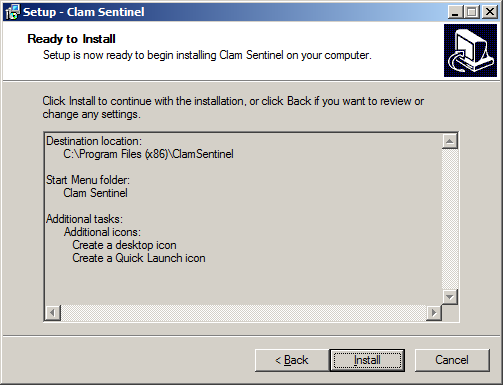 There is some information online at a page called Clam Sentinel Program Description And Setup. About the “Detect PUA (Potentially Unwanted Applications” (or “Select PUA”) option, this page says “You would not normally want to select this option” because of concerns of many false positives. The logic that only new files are likely to cause new false positives is false, because ClamWin updates could cause existing, previously-scanned-as-clean files to become detected. For anyone interested in customizing the above, here's an explanation: The inequality signs (< and >) specify that inside is what many computer programmers refer to as a “regular expression”. Folder names are separated by double backslashes. That should be all that one needs to know to simply change folders. The \. refers to a literal period. The other two periods refer to a single character (except for a new line character, although that exception isn't likely to be impactful in this case), similar to how many operating systems use ? to refer to a single character. The star means to repeat whatever came before it, and since the character before a dot is a wildcard for a single character, . * means a range of one or more characters. The ? in the above means to make the previous item optional, which in this case refers to the group that is created by using parenthesis. So, anything ending with .infected or .infected. * will not be scanned. Also, when Clam Sentinel is scanning, the tooltip may have “ - Scanning...” added to the end of the regular Tooltip text. Visit web page about the EICAR Anti-Malware Test File http://www.eicar.org/anti_virus_test_file.htm and locate some downloadable content near the bottom locate the downloads section. 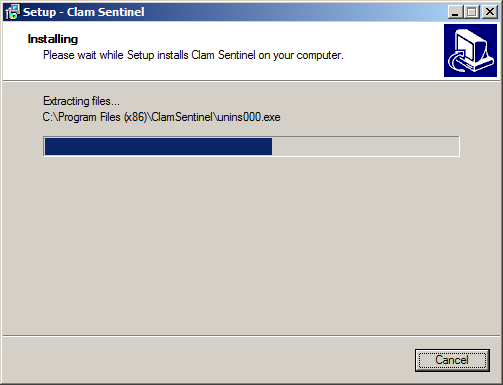 To see the renamed file, right click on the Clam Sentinel button and select “Quarantine Folder”. An Explorer interface will show the files that are in the quarantine folder. If a file already exists with a name ending with *.infected, the next file with the same name will be given a double extension of “.infected.000” and the next file will end with “.infected.001”. Note that the file renaming may be impacted by one of the options within the Clam Sentinel software that chooses whether to “Move to quarantine folder” or “Report only”. Presumably these are no different than ClamWin's signature files. In other words, presumably Clam Sentinel has no signature files of its own, and so the only signature files that are in use would be ClamWin's. 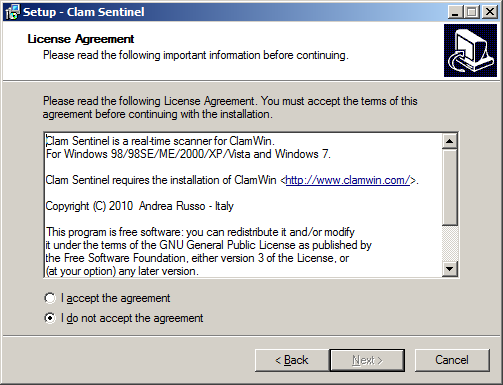 It appears that Clam Sentinel support requests on SourceForge may be regularly updated. See also: Clam Sentinel Support section on SourceForge (or, see also: alternate URL which redirects to Clam Sentinel Support section on SourceForge). The main Clam Sentinel home page tends to report the version number of the latest version, while not providing any details about exactly what is new between versions. It is nice to know why effort is spent upgrading software. Perhaps some details can be determined or guessed by reviewing ClamWin CVS Repository, sorted by date. Users of “Windows Home Server” may be pleased to know of a project made specifically for that operating system: WHSClamAV.sf.net. Tail Ace, a project on sf.net, monitors changes to files so perhaps it can be used effectively as part of a real-time solution?